Dragongate: Amazon Adventure # 8. The coconut. - and other concerns..
Amazon Adventure # 8. The coconut. - and other concerns..
We are back in the Inter-coastal waterway and headed south to Riviera Beach from where we will leave to sail to the Bahamas. Only ten days `til Christmas. Lake Worth, where we will exit into the open sea, is not so far off and what once seemed a distant goal, -that little strip of blue on the map of North America that separated Florida from the Bahamas - is now full of big waves, a strong Gulf Stream current and has grow in real terms to some fifty miles of salt water for our little untested catamaran to sail across. Our days of protected waters and canals, easy access to fresh drinking water, stores and laundromats are over. Are we ready for the next big step? Were Heather and I really smart after all to bring our children into this much danger? Today is my birthday: 15 years old - too bad it is n`t 16! Today on our way down the inter-coastal we could hear the surf on the Atlantic side of the islands just the other side from where we were. Every once in a while we could catch a glimpse of the ocean. Boy, I`m glad we are n`t out there today. High waves etc. We are still very much in the way of that norther. Hopefully it will be gone in a couple of days and we can make our crossing. For lunch today we stopped at a little sand beach. After we had finished lunch mom went for a walk and much to our surprise she found something, - a ripe coconut! First Gwyn bashed it with a hammer, then dad got out the saw. Finally as we all stood around and after much effort he managed to pry it open and we had our taste of the meat. Much better than the coconuts at the Fall Fair! For the rest of the day we motored and sailed down the canal. What a difference from Pahokee! This is quite obviously where the rich people of the great U.S. gather. Beautiful lawns, house boats, swimming pools. I would n`t mind living here permanently. Mom. Gwyn, Elaine and I went on a shopping trip in Jupiter ( just essentials according to mom) We had to go across a 6 lane freeway and a four lane highway. On the way back with 3 big brown paper bags (very heavy) and 2 plastic ones we got lots of toots and whistles and offers to drive us. Before leaving again we had huge helpings of pineapple sherbert ice cream Yum! Not a bad birthday. We are now anchored beside a ‘boat building’ place, - at least that`s what it looks like. Pretty quiet here. Mom`s making Lasagna and Gwyn is icing my carrot cake. Anne. Finally at anchor at Riviera Beach at a small park between two marinas. Heather and I went ashore in Hippolyta and found a whip aerial for the VHF radio and the loan of a soldering iron to make the connections. 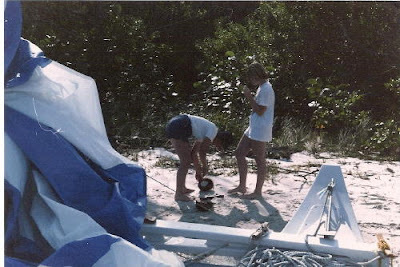 We stayed overnight at the marina next door and were about to hoist Gwyn up the mast to install the aerial when the owner of the borrowed bosuns chair ran down the dock and did it for her. Gwyn did n`t know whether to be relieved or cheated of her glory. Bill. Wind still from the north. We cannot cross the Florida Strait with this wind as, with the Gulf Stream flowing rapidly northward and the wind and waves blowing toward the south, there are very nasty steep and confused seas. We still have plenty to do. The outboard motor mount which was cracked and then repaired along the way has to be rebuilt using epoxy and fiberglass until it is stronger than the original. We all walk a long way in the heat to a laundromat for one last big wash and Heather and I continue down the long, hot, street to a Sears store to buy a replacement propane lantern. Our battery is now all charged up so we push off from the marina and back to anchor off the park again. Nice to be back at anchor again. A moon over Palm Beach across the bay. No bugs. Our new light is BRIGHT. Anne is so low on reading material that she is reading the manual for the VHF radio. When the wind is right we are ready to go. Bill. Raven Dreaming. "There is a Dream dreaming us."